Summer is grilling time and this delicious, meaty fish is great for the grill. The arugula salad provides a light, flavorful accompaniment for the meal that takes advantage of fresh seasonal produce. Combine arugula, basil and strawberries in a large bowl. Combine shallots, 2 tablespoons lemon juice, 3 tablespoons olive oil and 1/8 teaspoon salt. Pour dressing over salad and let marinate while fish is cooking. Season tuna with 2 tablespoons olive oil, 1/8 teaspoon salt and black pepper. 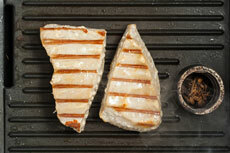 Grill tuna for 5-6 minutes, leaving untouched. Flip fish; continue to cook until internal temperature reaches 145 degrees or desired doneness, about 5-6 minutes. To serve, portion cooked fish on top of arugula salad.